anyone else notice that Fail in this picture almost looks like Fall? the product of slanted eyed construction. OH MY GOD! CHINA HAS MCDONALDS AS WELL!? if only there was some kid pretending to lean against it. GODZILLA IZ BACK RUN FOR UR F$%KING LIVES!!!!!!!!!!!!!!!!!!! 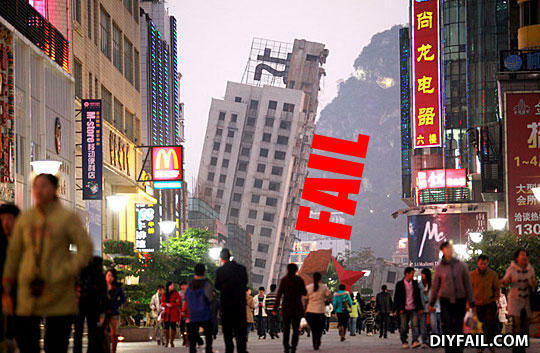 The Chinese are even copying the Leaning Tower of Pisa. did you seriously just say 'chineses'? what did the clock say to the other clock?